The Tom Fazio-designed Corales Golf Course at the exclusive Punta Cana Resort and Club opened for play in April 2010. With six Oceanside holes and a dramatic 18th, it's already a high flyer in the Caribbean rankings. Set out on cliff tops next to Punta Cana airport, a mile to the north east of the Punta Cana (La Cana) course, the Corales layout is a private layout that permits a certain amount of play by resort guests. Most of the fairways are routed around a residential development that sits a little way back from the coastline with the final couple of holes on each nine cleverly positioned adjacent to the deep blue waters of the Caribbean. Water only comes into play once on the front nine at the 390-yard 3rd but there are plenty of other hazards in the shape of huge waste bunkers to keep concentration levels high. The outward concludes with a stunning 173-yard par three, where the green sits in a rather exposed position atop a rocky headland. The back nine ends in similar dramatic fashion as the 214-yard 17th plays along the edge of the cliffs before the breath taking 448-yard 18th then dog legs sharply right around the Bay of Corales to the home green – all in all, a totally exhilarating way to end a round on a truly remarkable course. I visited Corales May 2012. The $300+ green fee was tough to swallow (I didn't pay that much to play Muirfield, Turnberry, Whistling Straits, etc.) I chose it because of the views shown on the web sites. The 4 holes on the ocean didn't disappoint; it's very Hawaii like with ocean spray, rocky coast line. The conditioning there is immaculate from tee to green, especially the fairways. The inland holes are fairly unremarkable, and unfortunately that is 14 holes. The second most memorable thing after the ocean holes is the fairways---the size of them. Captain Kirk could land the Enterprise there, then do donuts, and not come close to touching any trouble. Imagine a wide driving range, and you might be close. A few wild tee shots I hit resulted in my caddy saying, "Don't worry about it, it's okay." I can't imagine Tom Fazio designing a course like this on his own; it must have something to do with resort style golf required by the owners. Is it worth the price? After playing Punta Espada for half the price the next day, I would rather play Espada twice! The resort website states that "Corales will be played by a handful of people each day". This basically means that the course is in near perfect condition! The obvious stand out holes are 7-9 and 16-18 when the sea comes into view or play! But this course has so much more to offer there are actually 20 greens and an alternative tee position for the 17th which switches the hole around so the tee shot is either parallel to the sea or straight towards it. The course however offers much more than the "sea" holes numbers 3 (two greens),4,5,11 (265yrd par 3! ),12,13,14 and 15 (two greens) are all great holes. The choice of 5 different tee positions also makes the course enjoyable for all. The fairways have plenty of width however well placed bunkers and relatively small greens (compared with other new courses i've played) make the course very challenging. On the same break I also played Punta Espada from a golfing perspective (Punta Espada has the Wow factor) I would find it hard to choose the better course! Getting onto the course was not as difficult as the Punta Cana website makes out, trips that include taxi's to and from all hotels are easily available. If you go to the Dominican Republic I recommend you play Corales! 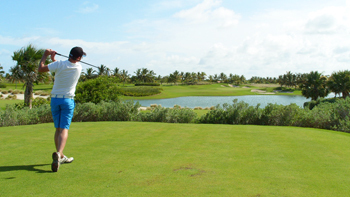 Corales is an exclusive private course in the PUNTACANA Resort in the Dominican Republic. A Tom Fazio design with seven holes along the impossibly blue waters of the Caribbean, its conditioning rivals the best golf courses in the world. This course is called to be top 20 in the World. I couldn't play it but walked it all and let me tell you something: Tom Fazio did something you will not forget, specially holes 8-9 and 16-18. The sea views will make you forget for a while you are golfing, but when you finish the round you want to play it again. Tee shot on 18th is the tee shot a really brave golfer would look for.